There has been much recent talk of driverless cars, with high profile companies such as Google joining a number of leading car manufacturers in developing systems to enable driverless cars to take to the road. 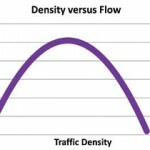 Richard Di Bona argues that whilst such cars may reduce congestion on segregated highways through increasing effective capacity, within city centres they may be more likely to increase congestion. It was not that long ago when driverless cars were the stuff of science fiction. But given the relentless pace of development in computing systems, both in terms of increased speed and reduced cost, as well as in visual recognition, such driverless cars are now deemed largely feasible. Indeed, there has been ever-growing press coverage of advances in automating cars, such that they can navigate and drive without any interaction from humans. This either for driving with automatic collision avoidance on highways or even to control a full journey, with humans merely stipulating the trip’s destination and perhaps also the time to make the trip. There has also been substantial commentary on how autonomous cars might improve road safety, road capacity and road environments in general. Whilst there are indeed grounds for optimism, there remain challenges to be addressed, including some possible negative outcomes, which appear to have attracted less media coverage. This article is thus intended to provide some balance. How long have driverless cars been in development? Whilst the Google™ driverless car is perhaps the most publicised, it is by no means the only, nor indeed the first driverless car under development and testing. The first autonomous demonstration vehicles appeared in the 1980’s, though these were not used on ordinary roads with other road traffic. It was with the advent of cheaper and faster sensors and computers in recent years that autonomous cars, potentially capable of mixing with other traffic became a reality. Progress with driverless cars now makes Level 4 autonomy realisable. The question then becomes what are the likely impacts of such full autonomy for vehicles? As will be argued, the impacts are likely to vary between segregated highways and mixed traffic in urban areas. Considering the potential impact of driverless cars on highways as opposed to city streets, i.e. on roads without pedestrians potentially crossing, kerbside parking or frequent junctions (potentially requiring vehicles to turn against opposing traffic), driverless cars have the potential not only to reduce accidents, but also to increase road capacities and decrease congestion. Driverless cars would have collision avoidance algorithms, which could perform braking or evasive manoeuvres more quickly than humans could react. However, over-and-above this is the potential for platooning behaviour. 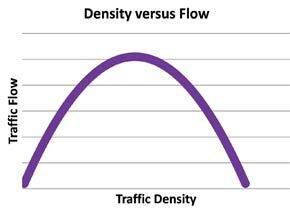 Under traditional, human-controlled driving, the capacity of a highway in terms of cars per hour or cars per lane per hour can be described using the Fundamental Diagram of Traffic Flow, as illustrated below. 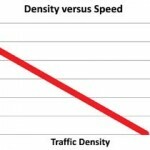 Figure 1(i) shows the notional relationship between traffic speed and the density of vehicles, reflecting the greater typical spacing between cars as speed increases. 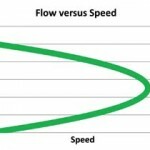 The consequence of this relationship on traffic flow versus traffic density is shown in Figure 1(ii) and on the resultant relationship between speed and traffic flow in Figure 1(iii). Driverless cars, which are not only continuously sensing their surroundings, but which moreover communicate with one another may enable the second of the above possibilities. Under computer control, ensuring that the speeds of vehicles travelling in a platoon or convoy are kept virtually identical, it becomes possible for cars to be spaced far more closely than would be deemed safe under human control. The effects of this on attainable traffic speeds and highway capacity are shown in Figure 2, with equivalent values for human control shown in lighter shades. 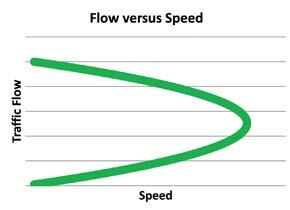 Figure 2 therefore shows just how much capacities and speeds might increase with a deployment of driverless vehicles able to communicate and coordinate with one another. Figure 2 assumes a lane or lane(s) of traffic given over to the exclusive use of driverless vehicles. 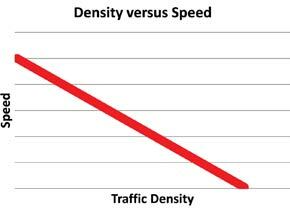 In mixed traffic, i.e. a combination of driver-controlled vehicles and computer-controlled vehicles, the scope for platooning is likely to be substantially reduced. Nevertheless, this still shows the potential for driverless vehicles to boost capacity and speeds on highways in an inter-urban context, e.g. for express ways and the like. But these benefits do not necessarily apply to urban environments! Some commentators have claimed that similar benefits could arise from the deployment of driverless cars in urban environments, i.e. with respect to speeds and capacities. However, this ignores the reality that the speed of driverless cars in mixed traffic would be constrained by the speeds and behaviour of other road users, such as human-controlled cars, other vehicles and also pedestrians crossing the road. Also, in many urban environments, the critical determinants of road network capacities and journey times are likely to be delays at junctions more than journey speeds between junctions. In fact, there are a number of other issues with driverless cars in urban environments which also need to be considered.